This is the third video release from the Royal Ballet in less than two years featuring Natalia Osipova. Following Giselle (Opus Arte Blu-ray OABD7151D) and Swan Lake (Opus Arte Blu-ray OABD7174D), the Russian ballerina now heads a fine cast in Frederick Ashton's La Fille mal gardée and this is by far the most successful of the three titles. 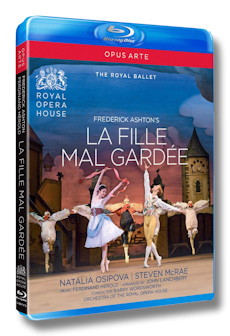 Incidentally, as was the case with Swan Lake, the Royal Ballet's La Fille mal gardée performed by Marianela Nunez and Carlos Acosta was released on video by Opus Arte not even ten years ago. The company clearly believes in the drawing power of their Russian star and suggests box-office successes are transferrable to home video. Ashton's 1960 La Fille mal gardée (or The Wayward Daughter ) is of course one of the evergreen gems from the Royal Ballet repertoire. Based on a much older French comedy ballet by Jean Dauberval which dated from the French Revolution, with Fille mal gardée Ashton delivered not only an irresistibly charming and jolly essay on beginning love, he also gave English ballet a face. The current revival of the original production, with the lovely designs from Osbert Lancaster, is wholly respectful and appropriate. The ballet clearly ages well and it's a delight to see how the company continues to enjoy and illuminate every step and action. Principals Natalia Osipova and Steven McRae are terrific and attractive dancers, relishing Ashton's technical challenges just as much as the manifold comical situations. Temperamentally and stylistically they come from a different stock, and some scenes look just a tad too studied, but don't let this spoil your pleasure: this is classical ballet at its most enchanting. Ballet lovers who already own the previous Fille ma gardée needn't worry, the dancers are so much different one can easily have both. Barry Wordsworth proves a reliable guide for the Orchestra of the Royal Opera House in Ferdinand Hérold's score, arranged and orchestrated by John Lanchbery. To make the feast complete, and another reason to own this new video, image and sound quality are topnotch in this Opus Arte release. Filmed live at the Royal Opera House, Covent Garden in May 2015, Ross MacGibbon delivers another expertly filmed ballet. As has become a good habit in the Royal Opera House series from Opus Arte, some fifteen min of extras are included on the Blu-ray. The main dancers are seen chatting about their roles, and more interestingly, Lesley Collier, one of the best interpreters of the ballet of recent times and now coaching Osipova, reminisces about her own work with Frederick Ashton in the 1970's. Highly recommended for all old, and young, ballet lovers.